Not your vehicle, but it should be, and how are you going to fix this situation? Not quite. Coupe or convertible ? Personally I prefer the coupe, the 1961. If you throw out the period where Ford owned Jag and seemingly tried to make it into clone of Buick I think I'd drive just about anything they've made. Okay, also not the current SUVs. And just so long as I have a lot of cash set aside for maintenance. If I got a '19 XF Sportbrake instead of the Audi RS6 Avant I wouldn't complain. @lesmore49 I’m not far enough along to have thought about motor / gearbox / suspension yet, but starting with your thought is my default. Kirkham will source all mechanicals including a 289, if desired, but has to be finished by someone. Seats, wheels, tires, paint, etc. It does come with an MSO, so registration is easier. The issue is, I have to work backward from who will service it. I’m not obsessive about reproduction or actual original components. Since they’re all hand built you can spec anything from a de-tuned City car to an autocross special to a weekend track car. 4 years coincides with the down ramp to retirement in 7. Sadly, I’ll probably end up with an electric Miata. Last edited by monochrome; 11-03-2018 at 11:12 AM. Lovely car. I recall when the AC Cobra first came out...back in '62 if my memory is right. I was a very young teenager and read all about it in Road & Track and Sports Car Graphic. Even though ...at that age..in the fall of '62...I yearned for the '63 split window Corvette coupe. Perhaps in Sebring Silver with a red interior and a 340 hp 327 under the hood? One reason I have none of the cars in the original post is that I do have this in my garage. It hasn't run in five or six years, and is lots of money and many hundreds of man-hours from running again. No more toys for me until I get this one running, and that's a gigantic task. That would do more than fine. More than fine. I always preferred the 340 hp/327...with the carb, rather than the fuel injection. Beautiful car you have there and I'm impressed and more than a bit envious. When I was a young junior high kid I recall walking to school with my buddies. It was October 1962. The first time I saw a ' 63 Split window Corvette...was one noon hour ...when a new '63 went by and we all almost fell as a group...as we turned in sync...to watch the Corvette coupe rumble by. It was that bronzey brown, with the 327 fuel injection . It was being driven by a local Chevy-Oldsmobile dealer who happened to live near. This was the only time he drove a Corvette, mostly he drove newer Impalas or Olds 88's...nice cars yes...but none of us tripped over ourselves when he drove these new cars from dealer stock. You're a fortunate man indeed. How did you acquire such a wonderful automobile ? Back in the late 1960's I had a boss who had some great cars and every so often we would swap cars for the day. One of those cars was a '64 Corvette convertible with a 327/300 hp, 4 speed. Nice. but does not approach your '63 327/340 hp, split window. The reason he liked swapping was because I had a '67 Camaro RS coupe with a 327 V8 and Muncie 4 speed. I keep lusting after BMW opposed-twin motorbikes - I sold my last one four years ago, since I wasn't using it enough to make owning it sensible since I retired, also because I have a bad back, dodgy sight in one eye and a lot less stamina than I used to have, need to walk a lot more to get exercise, and REALLY don't want to push my luck on the road any more. But I keep seeing bikes that make me want to change my mind and get back in the saddle. I didn't get married until I was 33. When I was 30 I found a guy from Australia who was living about a half hour from here. He was moving back down under and was selling all his toys. He wanted $25k for his '63 split window. Not a bad deal, despite the completely non-stock 396 block someone had dropped in years ago. Original block is long gone, but I do have the original hood that's in the picture. But it came with a '66 or '67 hood with the bump to allow for the big block. The motor has had various problems over the years, after kids were born and time was scarce I wasn't able to keep it up. Last time I tried to turn it over it had a serious fuel leak. At some point I had some work done on the lifters and the guy doing the work told me he thought I had a spun main bearing. So I really want to pull the body, look at the state of the chassis (suspect not great), pull the motor, get a 327 block and restore it to its 340 hp glory. But that's going to be a lot of time and money. 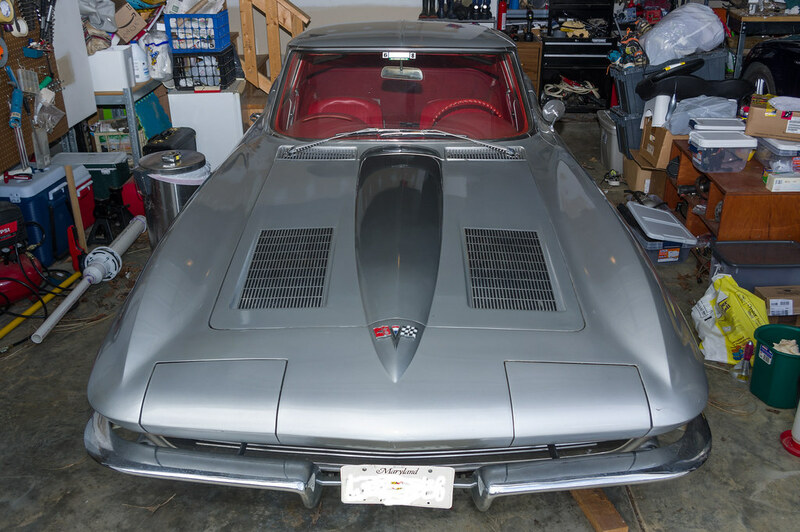 A couple years ago I took it up to a guy near DC who is a very well regarded Vette restorer with a huge shop, drives his own split window. He told me for him to get a early '63 block, build it up, install, and do a chassis restoration, but no body or interior work would be... wait for it... $60,000. That took a lot of wind out of my sails. I almost wish I'd bought a much lesser car 17 years ago. Something cheaper, quirkier like the 2CV or an old British roadster or something. Something more reasonable to afford to rebuild and keep running. But I can never sell the split window. Every time I think about it it's like a month ago when I had someone come repave the driveway... two minutes into the driveway conversation the guy sees the Vette, wanders over to look at it, take pictures, talk about how that's the holy grail of cars. Eventually we got back to paving the driveway. I'm putting a lift in the garage, maybe that'll get me started on the project. I suspect that in Australia mail delivery motorcycles are used on routes in sparsely populated rural areas...and therefore the capacity is not as important, due to less mail/packages being delivered and distances between mail customers are great...hence economy of operation is paramount. I'm just speculating though, I'm not familiar with Australian mail delivery conditions. Motorcycles are used pretty much everywhere here. I live in Melbourne, the 2nd largest city in Australia, and all of the paper mail is delivered by motorcycle. However, I'm pretty sure every few blocks there's a big steel box that the vans come in the morning and fill with a bike's worth of mail. So the bike leaves the post depot in the morning, does it's run, and at the end of a few blocks they stop and unlock the roadside box and grab another bag of mail. Rinse and repeat a few times over their shift. Partly because they're right-hand-drive, so the postman can reach the mailbox*. The only RHD cars in the US are postal vans and a very small handful of old imports from the UK and Japan. I'd guess import regulations and maybe the chicken tax prevent just using UK market RHD Transit vans. *Do other countries have mailboxes out by the road in front of your house? I don't think I ever noticed. So mailboxes here are roughly 5m (~15ft) from the road. @ThorSanchez This one will do for me. I once passed on one of these asking $15.000. Three young children. I once passed on one of these asking $15.000. Three young children. At an adult gathering my brothers friend once tried to justify a Corvette (non-collectible) as an ideal family car. It was years ago so I can't recall his argument, however I'm sure more than a few beers were involved. The new ones get about 30 mpg on the highway. Imagine how much gas money you'd save compared to an SUV, all of which can go into the kids' college savings. Plus the Corvette is about the same price as a new Suburban. Very practical. As I said in the original post a Morgan is on my very short list of ridiculous things I'll one day buy. Just love the look. 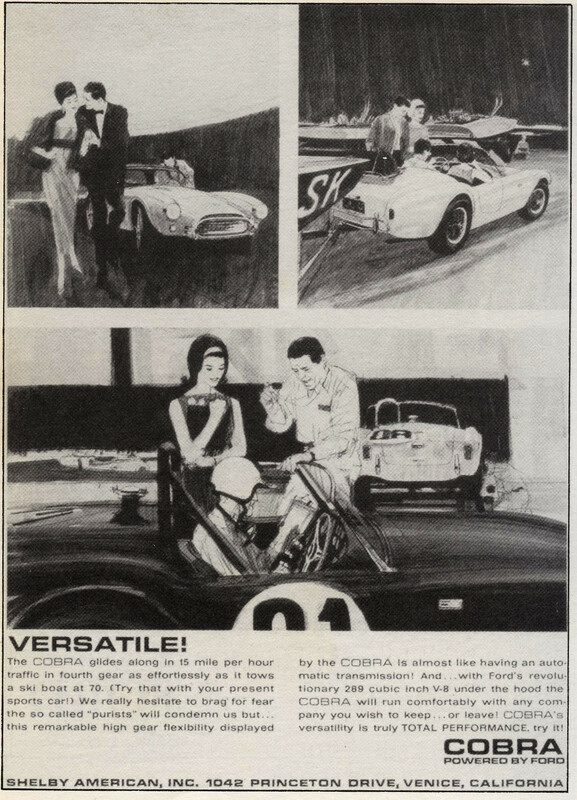 This ad points out the practical nature of the Cobra, which you can use to tow your ski boat. A Corvette might be even better if your ski boat or Chris Craft has a small block Chevy. 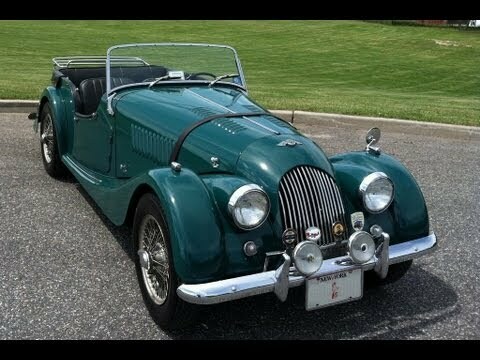 The Morgan would be practical for me, because I could repair the wood frame if necessary. It is an exciting process to plan out a car where you can make many decisions. As far as an electric Miata goes I have a feeling within the next 5-10 years I too will end up with an electric car...hopefully I can at least have a hybrid ... internal combustion/electric vehicle. I do like and prefer the sound and driving characteristics though of a powerful, purely internal combustion vehicle. I know the feeling. At one time I rode motorcycles quite a bit and had a number of bikes over the years. However the motorcycle I always wanted was an English, big single cylinder or big Brit twin cylinder...of the Desert Sled variety. This desire started back in the late '60's and at that time I couldn't afford one of these motorcycles..I had a car, I was young, starting to think about attending university, etc. The usual life things. As time went by and as our kids got older and money flow..improved...just a wee bit...I kept my eye open for the aforementioned British Desert Sled. This was around 2000 and by that time these old bikes that I had a hankering for were all approaching 30 + years old and getting scarce. I came upon one, that fit my bill. I bought it. It is a '67 Matchless 750cc (Norton Atlas engine) and is a factory bitsa. Big Norton twin, in a light weight Matchless frame, modified for more travel... Norton Roadholder front forks...Lyta aluminum racing tank, skid plates, low gearing twin Amal carbs, Norton sports cam, etc. Officially these bikes were both Norton and Matchless...badge engineering ....as they came from the same AMC (Associated Motorcycle Company ) factory that built Norton, Matchless and A.J.S. I've had it for 18 years now and I'm still restoring it...slowly and sometimes not too surely. I have a feeling our son, who rides a BMW G/S will eventually inherit it and continue the build. At least I hope so. Last edited by lesmore49; 11-04-2018 at 11:29 AM. All times are GMT -7. The time now is 08:07 PM. | See also: NikonForums.com, CanonForums.com part of our network of photo forums!